November 7, 2015 November 7, 2015 / Steve M.
A really good find, and the best copy I have seen in the last 10 years, you would not believe the trouble that I went to to finally get this in my hands, but now I have it a near fine copy, which is still resistant to being opened, hence the images are restricted to the cover and the title page. 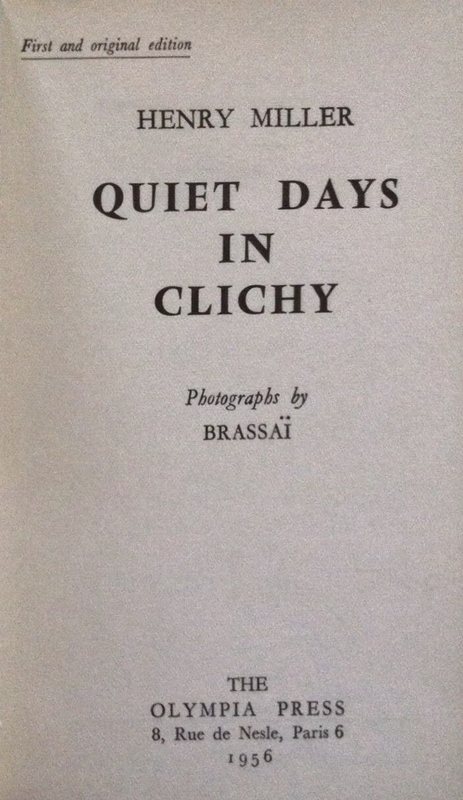 First and original edition | HENRY MILLER | QUIET DAYS | IN | CLICHY | Photographs by | BRASSAÏ | THE |OLYMPIA PRESS | 8 Rue de Nesle, Paris 6 | 1956 Collation: 176 pp. -4; the final gathering is actually signed 21, but should be 22 because due to a printer’s error the fourth and fifth gatherings are both signed 4 causing all subsequent statements to be off by 1. 17.5 x 10.5 cm., all edges trimmed. Printed on thick, white wove paper. Contents: pp. [1,2] blank. p.  QUIET DAYS | IN |CLICHY, reverse blank. p.  title, as above. p.  FOR A |COMPLETE LIST OF HENRY MILLER’S WORKS | ON SALE IN FRANCE, | WRITE TO : | THE OLYMPIA PRESS | 8, Rue de Nesle, Paris 6 | Printed in France | [rule] | All rights reserved by Henry Miller. Copyright 1956. pp. 7-171, text. p.  blank. p.  PRINTED BY | IMPRIMERIE MAZARINE | AND IMPRIMERIE AULARD, | PARIS, | IN JULY 1956 | FOR | THE OLYMPIA PRESS, | 8 rue de Nesle, Paris 6e | PRINTED IN FRANCE | [rule] | Dépôt légal, 3e trimestre 1956. pp. [174-176] blank. Sixteen pages of plates interspersed through the text. Binding: Thick card wrappers, with abstract design in black, gold, grey and white across front cover, spine and back cover. Thin gray free endpapers. 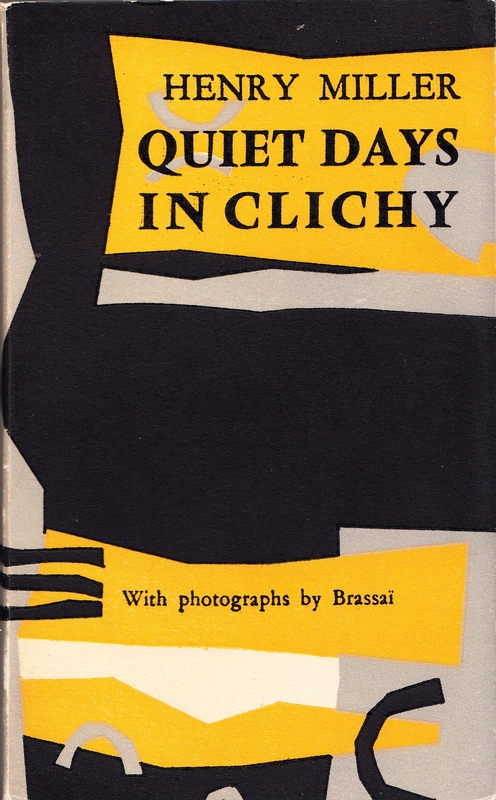 Frontcover; title and author printed in black within gold panel, superimposed over grey designs: HENRY MILLER | QUIET DAYS | IN CLICHY. Printed in black within gold panel: With photographs by Brassaï. 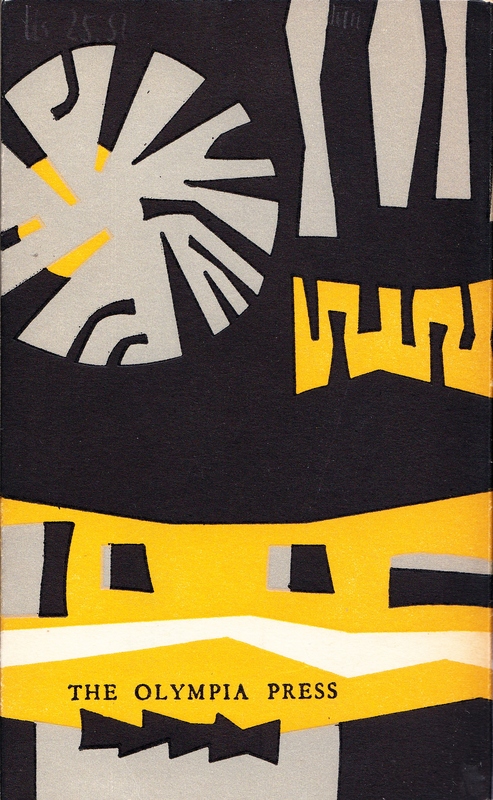 Printed in black yellow panel on back cover: THE OLYMPIA PRESS. At the foot of front inside flap: COVER DESIGN BY T. [Shinkichi] TAJIRI. Back inside flap blank. Notes: (1) Some copies of this edition have been reported in which the plates have a gloss finish instead of a matt finish. See: A Descriptive Catalogue of the Dr. James F. O‘Roark Collection of the Works of Henry Miller (Santa Barbara: Joseph the Provider, catalogue 22, item A182). The compilers of this catalogue noted that their copy lacked the colophon, and so were unable to say whether this copy represents a special issue or whether it received individual attention. However, a letter from Roger Jackson, Henry Miller’s bibliographer, to the present author dated October 22, 1992, indicates that in all respects save the difference in photographs the copies he’d examined with matt and glossy plates were identical. It would seem that trial copies of the first edition with illustrations in both states were run off, perhaps to determine which looked better. Since copies with matt plates are more common one must assume that this design prevailed, but that the few copies with the glossy plates were released with the main print run rather than merely destroyed. (2) In William Ashley’s copy of this edition there is only one signature numbered 4 (on p. 33), and yet the arrangement of the stitching and faulty numeration of the later signatures is identical to the compiler’s copy. The only way I can account for this is to think because the signatures are located close to the edge of the leaf, in Mr. Ashley‘s copy the signature was missed during printing or cut off during the trimming/binding process. (3) Prosecuted on May 5th, 1959 under article 14 of the 1949 law. Bibliographical description courtesy of Patrick Kearney, The Paris Olympia Press, Liverpool University Press 2007. The index number indicates the actual location of the description within the bibliography. ← MES ÉTAPES AMOUREUSES [par] E. D. Imprimé pour les Colporteurs Gascons [Paris , Marcel Sehuer] c. 1935].